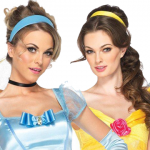 Disney Princesses and Disney Princess costumes are always extremely popular (check out our Top 10 list if you haven’t already), so we decided to share some fun facts about every princess. The current (at time of writing) official Disney Princess line-up includes Ariel, Aurora, Belle, Cinderella, Jasmine, Merida, Mulan, Pocahontas, Rapunzel, Snow White, and Tiana. We’re also going to include Anna and Elsa from Frozen, because come on – we all know they’re going to be added to the line-up eventually. So, here are 65 interesting facts about the Disney Princesses (or, 5 for each one). Read on and have your mind blown! Anna’s original name was Greta. Anna has the most freckles of any Disney Princess. Some pieces of Anna’s official promotional artwork were modified from unused art of Tiana. Anna is the only Disney Princess with a villainous love interest. 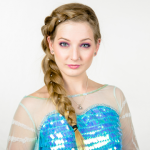 Anna has the most voice actors in a single film of any Disney Princess, with four: Livvy Stubenrauch, Katie Lopez, Agatha Lee Monn, and Kristen Bell. Ariel ended Disney’s longest drought of introducing new princesses. Before The Little Mermaid in 1989, the latest princess introduced had been Aurora, in 1959. Ariel is the Disney Princess with the most licensed, themed merchandise. Ariel has sung more songs than any other Disney character. In the original Little Mermaid concept art from the 1940s, Ariel had black hair and a blue tail. Ariel was the first Disney Princess to be animated with the aid of a live-action reference model. Aurora only has eighteen lines of dialogue in Sleeping Beauty. Coincidentally, she also only has eighteen minutes of screen time. Aurora is the only Disney Princess whose debut feature film was a commercial failure, making only $5.3 million in its original theatrical release on a $6 million budget. Aurora is the only Disney Princess who is a false protagonist; the three fairies are the true protagonists. The Brothers Grimm version of Sleeping Beauty is called Briar Rose, which is also Aurora’s assumed name when living with her fairy godmothers. Belle is the only Disney Princess to not sing her film’s theme song on screen. Belle was the only Disney Princess nominated for the American Film Institute’s “100 Years… 100 Heroes and Villains” list. Belle is the only Disney Princess to have her film nominated for the Best Picture Academy Award. Belle originally had a younger sister, Clarice, who was not in the final version of the movie. Belle is the only person in her village that wears the color blue. More than 400 voice actors auditioned for the role of Cinderella. Cinderella’s actual shoe size is mentioned in her sequel films – it’s 4½. Cinderella’s birth name was not “Cinderella” until the Disney film. Previously, it had only ever been a nickname. In a deleted scene from the film, Cinderella dreams of an army of Cinderellas to do her chores. Cinderella was the first Disney Princess to sing in multi-tracked vocals. Elsa, at 21, is the oldest Disney Princess and the only non-teenager in the group. Elsa’s name refers to Eliza, a heroine from another Hans Christian Andersen story. 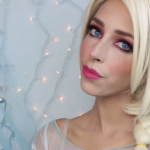 Elsa is the first Disney Princess to actually become a queen. Elsa originally had short, spiky, black hair in her concept art. Elsa is the first Disney Princess to canonically be aware that another Disney Princess exists. Jasmine was the first Disney Princess to have separate speaking and singing voice actors. Jasmine is the only Disney Princess who isn’t her film’s main character. Jasmine was originally going to be named Badroulbadour, after the princess who marries Aladdin in Arabian Nights. Jasmine is the only Disney Princess to not have a dress or gown as her official costume. Jasmine is the only Disney Princess that ever kissed a villainous character. Merida is the only Disney Princess to not have originated from a work of literature or historical figure. Merida is the only Disney Princess to have a biological brother (she has three). Furthermore; Ariel, Elsa, and Anna are the only other Disney Princesses to have biological siblings at all. Merida was the first Disney Princess without a love interest in her film. Merida’s curly red hairdo is made up of 111,700 hairs that were generated from over 1500 individually sculpted models. A year before the release of Brave, Merida and her parents were seen depicted in a tapestry in the background of a Cars 2 scene. Mulan is the only Disney Princess that isn’t a literal princess by blood or marriage. In the Chinese dub of Mulan, Mulan uses the pseudonym “Hua Ping,” which is a Chinese slang term for an effeminate man. Mulan is the only Disney Princess based on a mythological character, the Chinese epic hero Hua Mulan. Mulan has the highest on-screen kill count of any Disney character, including villains! The mountain pass battle scene in Mulan shows 2,000 individually animated Hun soldiers, and Mulan buries all but six of them in an avalanche. Mulan appears in issue #2 of Marvel’s Deadpool Killustrated series. Pocahontas was the first Disney Princess based on a verifiable historical character. Pocahontas was the first Disney Princess to have a human best friend. Pocahontas was not the first Native American princess in a Disney film – people tend to forget about Tiger Lily from Peter Pan. Pocahontas was the only Disney Princess to never change costumes in her debut film. She is also the only Disney Princess to have never worn a tiara in any film. Rapunzel was the first Disney Princess with a PG-rated film. Rapunzel’s hair is 70 feet long. After having it cut, Rapunzel also takes the Disney Princess record for shortest hair, beating Snow White. Rapunzel and Flynn have the largest age difference of any Disney couple. The role of Rapunzel was originally auditioned for by Idina Menzel, of Frozen fame. Snow White is the youngest of the princesses, at 14 years of age. In her original fairy tale, Snow White is only seven. Snow White’s skin tone and appearance were achieved by the animators using real makeup on the animation cels. Snow White’s costume design was based on a character from the 1935 Disney short, The Cookie Carnival. Snow White’s voice actor, Adriana Caselotti, was contractually forbidden from performing again, to keep Snow White’s voice unique. Tiana has the most different on-screen costumes, with eleven. Tiana only has nineteen minutes of screen time as a human. Tiana is the only Disney Princess with a job. Are you dressing up with a Disney costume this Halloween? Who is your favorite Disney character? Share your thoughts with us on Facebook and Twitter, and check out our Pinterest boards for even more costume ideas! This is an awesome list! I definitely did not know Snow White was so young! I also didn’t remember Mulan being so violent! no one ever mentions anastasia..last time i checked shes disney and a royal member of imperial russia…. Actually she is not Disney, FOX I believe. Anastasia was not created from Disney. I know, it’s confusing, but the movie Anastasia was made from another company and team. Anastasia is Disney-like, but is not a Disney princess. 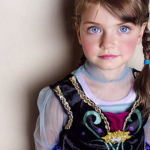 Does anyone know why almost all the Disney princesses are only children? What do you mean that Elsa is aware of other princesses?